Manuel Trazazas Gonzaullas was born on the Fourth of July, 1891 in Spain. His parents were naturalized US Citizens but were in Spain at the time of his birth. Manuel was brought up in the border town of El Paso. He was reportedly inspired to become a Texas Ranger after seeing Ranger John R. Hughes on horseback when Gonzaullas was only a youth. His desire to pursue a career in law enforcement was further led by the murder of his two brothers and the serious wounding of his parents in an incident. He did not join the Rangers at his first opportunity, but rather served in the Mexican Army and an agent for the US Treasury Department for five years. He married in 1920 and enlisted in the Rangers later the same year. Gonzaullas’ first posting was in the Oklahoma-Texas border county of Wichita County where his responsibility included policing gambling, bootlegging, bank robbery, riots, prostitution, narcotics trafficking and the general lawlessness that followed the oilfield boom towns. It was here that he acquired the nickname “Lone Wolf” for often going alone to put down troubles in the old oilfield towns. It was here that he was first called that in the Wichita Falls Daily Times. He earned a reputation of being a tough and relentless lawman. Gonzaullas was an excellent shot and was known for being steady under pressure. Highly respected for his work, he is referred to as one of the “big four” who had a strong impact in crime fighting of the period: Gonzaullas, Frank Hamer, Tom Hickman and Will Wright. Gonzaullas along with most other Rangers were fired by Governor Miriam “Ma” Ferguson in 1933 and reportedly replaced the leadership of her political allies. This was allowed to stand until 1935 when the Texas Department of Public Safety was formed with the reconstituted Rangers being made a division of the DPS agency. Gonzaullas was hired and appointed as a superintendent of the Bureau of Intelligence of this new department. Following this, the Rangers under Col. H. H. Carmichael transition to becoming one of the finest scientific crime fighting units. He remained there until 1940 when he rejoined the Rangers in Dallas. He was appointed Captain, the first Hispanic to hold that position. He served the Rangers until his retirement in 1951. Following retirement, he worked for many years as a consultant to the motion picture industry. 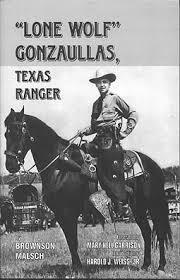 Gonzaullas consulted on many radio and television series including Tales of the Texas Rangers and a number of films. The feature film The Town That Dreaded Sundown was based on his experiences on an assignment in Texarkana to solve the 1946 murders of the so-called “Phantom Killer.” The crime drama was released in 1976 and starred Ben Johnson as Gonzaullas’ character, renamed J. D. Morales, and other well known actors such as Andrew Prine, and was filmed on location in Texarkana. The screenplay was rewritten, filmed and released again in 2014 as a feature film under the same name. This time actor Anthony Anderson played the part of “Lone Wolf Morales” and the film was released in the horror, thriller genre. Gonzaullas himself was a co-founder in 1968 of the Texas Ranger Hall of Fame and Museum in Waco. He retired and lived in Dallas until his death in 1977. He was inducted into the Texas Ranger Hall of Fame and upon his death, he left his weapons, scrapbooks and other material from his lengthy and distinguished career to the Hall of Fame. For many years he carried two .45 revolvers bearing engraving that said “Never draw me without cause, nor shield me with dishonor.” He is interred at Sparkman Hillcrest Cemetery located in Dallas, Texas.